One of summer's greatest pleasures for me is rain in the night. I love to wake up and hear the rustling of raindrops approaching, then the thickening of the shower into a soft curtain of sound. It makes me deeply aware of the comfort of the cotton pillowcase, the heft of the quilt, the stillness of the rooms where my family sleeps. I feel the meaning of shelter. I also think about my garden drinking in the rainwater: the shallots growing fat, the cucumbers swelling, the cabbage adding leaf upon leaf. I think about the tomatoes turning from early matte green to shiny yellow to the polished red of ripeness. Waking to rain Saturday night, it was the thought of my tomatoes that torqued my rainy reverie into dread and worry. Rain drives late blight the way wind drives a wild fire. Another gardener had given me the news Friday: Late blight is in Scarborough, she said. It's in Waldoboro. The storms this week spun it everywhere. I lurched home to inspect my tomato plants. And there, on one plant, were the telltale signs: Curling black leaves, dark patches spreading on the stems. I shook. I stood there in the garden, and I shook. After last summer's ordeal with late blight, I didn't feel equal to it again. I fell to work though. I cut out the blighted plant (with its load of maybe a hundred little pearly tomatoes, still green). I bagged it. I loaded my sprayer with the organic spray that got me through last season, one arduous day at a time. I sprayed my Pinks, my Persimmons, my Ruby Golds and Sungolds. I looked at the abundance of the San Marzanos. So many times this season, I've gone out to the garden for the sole purpose of reveling in the tomatoes as they set fruit. This year, until now, had been the perfect growing season: early warmth, steady warmth, lots of sunlight, enough rain. And now blight threatens all that potential bounty. I should know better than to get my hopes up. A gardener, this gardener anyway, lives with threat: Groundhogs three years ago, a devastating hailstorm summer before last, two months of rain and blight last year. But hope sprouts in a garden. It comes up as reliably as the weeds. I won't have the luxury of just reveling in my tomatoes now; I'll have to toil for the harvest. But toil I will. How about you? How does your garden grow? 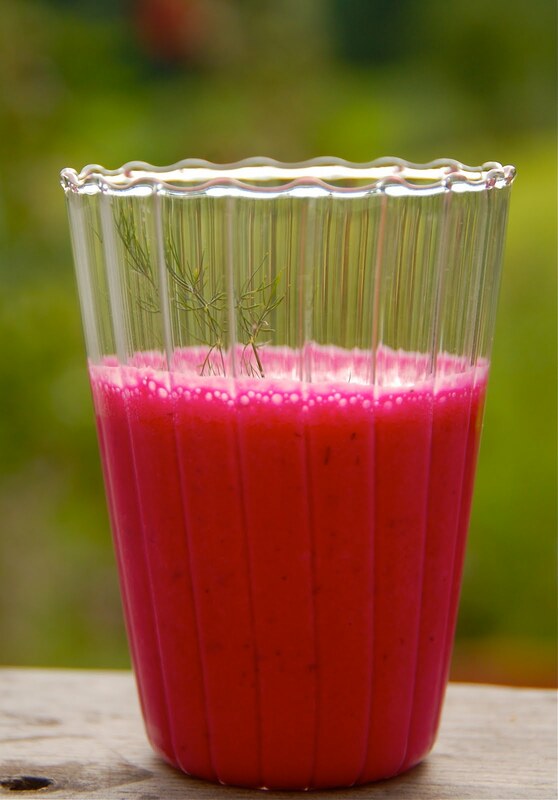 Beets are beautiful and sweet and fun to grow. We love our beets. When I pull a bunch from the garden, I admire them for a while, sometimes a long while. Their leaves are beautiful, veined through with fuchsia. And the globes themselves are very satisfying for a gardener to hold in the palm of her hand, that hefty roundness. Admiring a beet, I feel like a hen considering her egg. My favorite way to prepare beets is roasted at high heat (about 400 degrees F). I rub them with olive oil and nestle them together in foil. 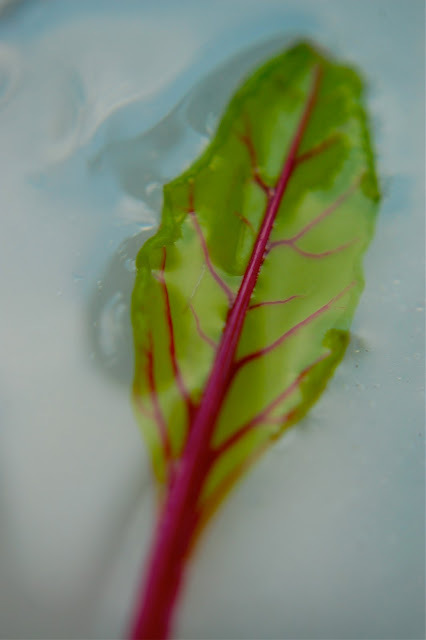 It usually takes about a half hour for fresh beets to reach the point where they can be pierced by a knife (about the consistency of cold butter). If I don't have to peel them then, I don't. I pop them into the fridge to save for quick preparation of a summer meal. They peel very easily when they are chilled, and it's simpler to slice them, chunk them or grate them when it's not like playing hot potato. We eat them every which way. Recently, I had about a cup of leftover grated beets. They were dressed in a bit of olive oil and a dribble of balsamic vinegar. I tossed them into the blender with some fresh dill, a diced shallot, and a cup of vegetable stock. I whirred it all together, then added a dollop of sour cream and another of yogurt. I put it into the fridge to really chill. Later, the four of us sat on the porch and sipped a sweet, pink soup that tasted so deeply of our garden that it reminded me of all the pleasures of growing beets: the grainy little seed getting poked in the soil, the first ruby knuckle sprouting up, the beautiful leaves turning glossy and tall, and then the bulb swelling into sight. That simple soup was what makes feeding ourselves from the garden irresistible. Hurry up and eat! The weather is hot, hot, hot, and the lettuce is about to bolt! Now is the time of summer when we gardeners need myriad ways to use lettuce. Even my green-leaf-gobbling girls are now balking at salad—which is how we tend to think of lettuce in this country: It's a salad. But, truly, it is so much more. In other cultures, it is stir fried, melted in boiling broth, even baked with cream. This summer, a groundhog brazened his way into my salad-growing boxes, which are the planters on my back porch. Yes, you heard me: Not only have the goats been nibbling at my back-porch greens, but also a groundhog, who chomped through my snowpeas, my basil, my dill, my cilantro, and my darling little just-budding zinnias. Luckily, I have a neighbor, Farmer Up-the-Hill, who gardens on a scale that makes my vegetables look like something grown in gardens out back of my daughters' dollhouses. Last week, Farmer Up-the-Hill shared his about-to-bolt bounty with us. I was in a French mood. So I broke out my much-splattered copy of When French Women Cook, by Madeleine Kamman . Great news for those of you who don't yet have your own cherished copy: This must-have classic is about to be re-issued in August with a foreword by Shirley Corriher, another of my idols. And look at the cover! Is that the most evocative cookbook cover ever? I want to be right there at that table with them. I leafed through my cookbook and...voila! There was the perfect dish...La Soupe aux Petits Pois Frais. Melt the butter. And the onion and leeks and saute until translucent. Add the lettuce and toss until it wilts. Add the sugar, salt and pepper until it tastes good. Add the stock. Bring to a boil and simmer for a half-hour or so. Strain the soup through a sieve or food mill. Return to the cooking pot; bring back to a boil. Add the peas and simmer ten more minutes. Mix sour cream and cream together, and then blend it into the soup. Reheat carefully without boiling. Serve piping hot with the croutons floating on top. I like it the next day for lunch, still chilled. Now, I said lettuce two ways, didn't I? That's because I have one little salad trick tucked in my apron pocket. I loved it as a child, and my children love it too. How my dear mother managed to prepare it on hot days in Missouri, I will never know. But, bless her, she did. So if you think your family could swallow one more salad, here's the one that will make them happy to do so: dear Camie's Wilted Green Salad. The secret ingredient is (ahem)...bacon. ...and purple clover dressed to dance. ...while the wild yarrow would be feeling delicate. Black-eyed Susan would be waiting for the sun to come out and play. ...while purple vetch would be getting high. The bee might pause on a clover leaf to sip some water full of the sky. He would find the first goldenrod buds reaching for the light. Pink clover would be all come hither. And even Queen Anne would be winking from behind her lace veil. July is a beautiful time to be a fanciful bumblebee in our meadow. I know the homecoming of our sweet Buttercup and Clover has inspired much elation in our bloggy neighborhood — and a pinch of envy too. (Dear Lyanda confessed as much.) And while there is plenty of bliss here over the jump-and-tumble goatiness of our new lives (goats scampering on the picnic table, goats clambering up the wood pile, goats cavorting in the meadow), there is also some...how shall I put this delicately? Well, there's some consternation on my part. I am, after all, the gardener of the family. 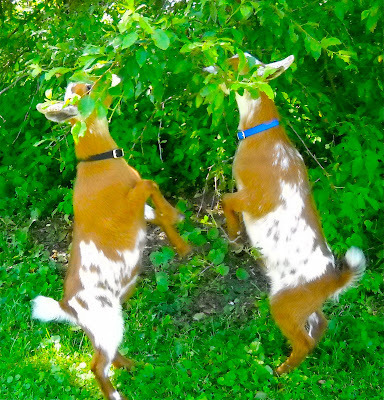 And while I love the goats, the goats love the leafy greens of my labors, and that has caused some tension between us — just as some of our perspicacious friends (I'm looking at you, Tom, and you too, Clare) predicted. The leash was a good idea, but who leads whom? Blossom and Fern are very vigilant about the goats' whereabouts. But goats move fast... One minute they are trying to get in the back door, and the next minute they are around by the front door eating the ornamental pine tree that finally, finally, finally got tall enough to disguise the ugly retaining wall, which the goats were standing on so they could eat the top out of my lovely little evergreen. I might have shrieked some more. Later, Blossom tried to console me: "But, Mommy, the pine made their breath really really fresh." Birch has intervened. Fencing the goats' run was slow work. But he made sure that it was a large, shady space with lots of jumping opportunities: a goat playground. When he finished and the girls led the goats in, it was glorious fun. Birch reported to me, "We've achieved TGH!" It remains to be seen whether we've achieved Total Mommy Happiness. I'm worried our little darlings can climb fences. Soon the fireflies will lift into the meadow. The stars will shine in the soft summer darkness. We just might not stir for fireworks.